A lot of people don’t know that they need to have their eyes checked at least once a year. For many people eye conditions go unnoticed until it is too late and already affects their vision. That is why it is very important to have your eyes checked regularly. The main purpose of an eye examination is to determine the condition of your eyes. This is to discover any early signs for eye diseases. Early detection and the appropriate treatment will prevent you from permanent vision loss. The ophthalmologists and optometrists will use a variety of tests and procedures to examine your eyes. Usually an eye examination will take around 2 hours. The purpose of the general eye exam is to determine whether your eyes are in a good condition and to prevent risks of any refractive errors like myopia, hyperopia, astigmatism or even presbyopia. In many cases though, the doctor can diagnose and detect many signs of early stage common acute eye diseases, that may result in vision loss permanently like: glaucoma, retinal detachment etc. (afterwards the doctor may request more intensive tests correspondingly). Cao Thang Eye Hospital offers 3 different packages regarding to eye examinations. • Intraocular Pressure test (IOP). • Consultation with the ophthalmologist. Visual acuity is literally the sharpness of your vision. The doctor will measure your visual acuity by your ability to identify letters or numbers on a Snellen chart (see image on the right) from a specific viewing distance. 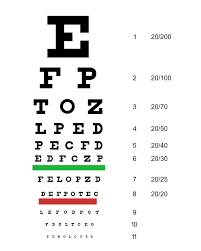 During this test the doctor will ask you to cover one eye up while you try to read the Snellen chart. Refraction test and cover test. This test will determine the exact eyeglass prescription. The refraction test will determine your level of hyperopia (farsightedness), myopia (nearsightedness), astigmatism and presbyopia. During a intraocular pressure (or IOP) test, a tonometer is used to measure the pressure inside your eye. Your eye will be numbed with eye drops, and a small probe gently rests against your eye’s surface. If you have high eye pressure (high IOP reading), you may be at risk for or have glaucoma. High eye pressure indicates a problem with the amount of fluid inside your eye. Either the eye is producing too much fluid, or it’s not draining properly. 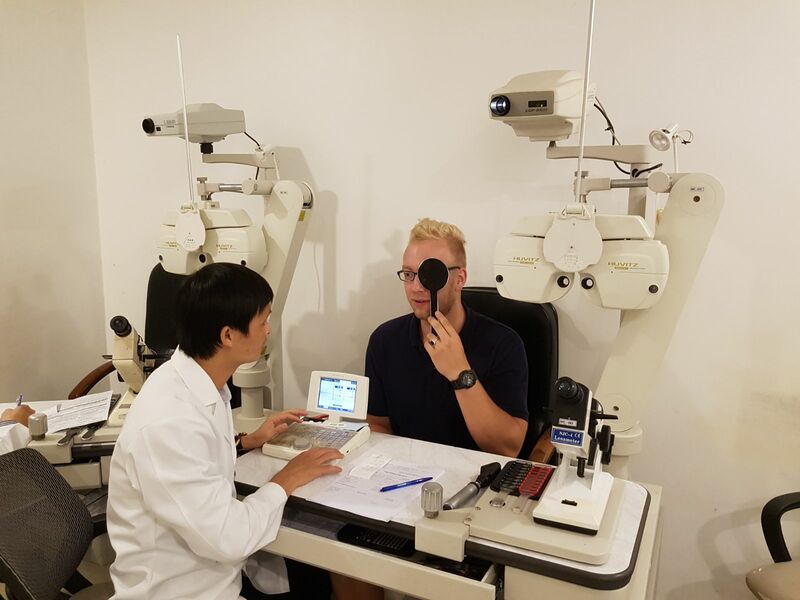 During consultation the doctor will perform a slit lamp examination (binocular microscope) to examine the structure of the front of your eyes under high magnification like: eyelids, cornea, conjunctiva, iris, and lens. Cao Thang Eye Hospital’s Comprehensive Imaging service is managed by a team of fully-accredited ophthalmology specialists. 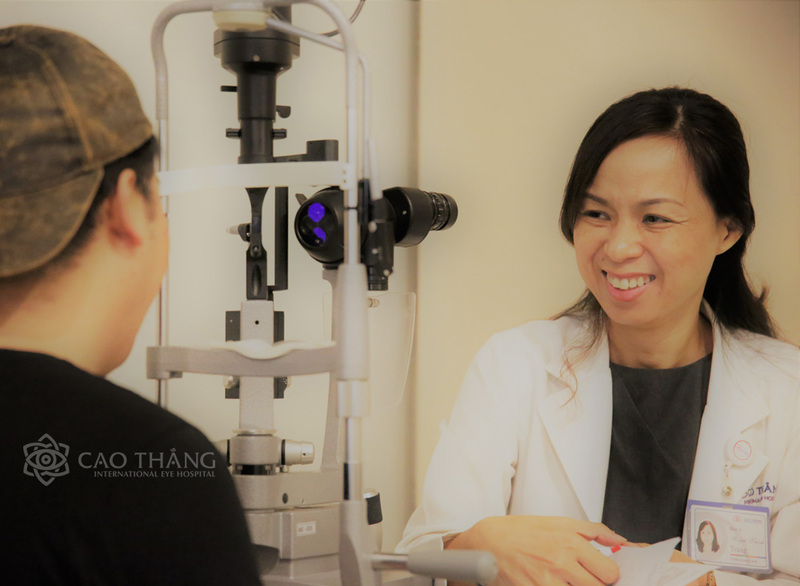 Dr. Nguyen Dung, assisted by experienced optometrists and support staff, heads the Service and performs the following procedures below. OCT (Optical Coherence Tomography) is a medical imaging technique that captures three-dimensional images of biological tissues using near-infrared light. This procedure is widely used to assess macular degeneration, thanks to the high-resolution images of the anterior segment of the eye and of the retina that it provides. A wrong power calculation results in unsuitable output for the patient. Cao Thang Eye Hospital’s Imaging Service aims at maximizing the success rate of operations and does so by using the best biometrical technologies. Cao Thang Eye Hospital uses the most-cutting edge OPD Scans to ensure that the implantation of an Intraocular Lens (IOL) following a cataract removal is tailored for the patient’s eye. Angiography – or Fluorescein Angiography – is an eye examination intended to picture the blood vessels within the patient’s eye. It is not an x-ray procedure, therefore no radiations are involved. It allows doctors to check the blood flow within the patient’s retina and to look for abnormal vessels (swelling, etc.) and tumors. Patients with high blood pressure, diabetes, sickle-cell anaemia are at risk and necessitate such examinations. It is performed with a dye that is injected in the patient’s arm. This dye will enable the camera to take pictures of the blood vessels in the patient’s eye. The examination is completed within a short time and causes little if any discomfort.